Unless you’ve been hiding under a rock or stuck grinding online where you are so locked into the games that you haven’t paid any attention to the world off the virtual felt, you most likely know that the Winter Olympics in Sochi kicks off on February 6. Team USA will be out in full force hoping to bring home more gold medals than there are gold bracelets in several years’ worth of World Series of Poker editions. Many athletes competing at the Winter Games have worked hard to position themselves for Olympic glory, but they also enjoy competition outside of their respective sports, including playing poker. Here, three of America’s best hopes for bringing home gold medals aren’t shy about sharing their enthusiasm for a game that doesn’t require much physical athleticism but does require the same mental toughness that has helped push them to the forefront of their individual Olympic sports. David Wise is no stranger to feeling the rush at a poker table and the even bigger rush skiing a half-pipe. This lifelong Reno, Nevada resident grew up close to Lake Tahoe and from an early age pursued many of the sports the Reno area is famous for, including cliff jumping, mountain biking, world-class skiing — and poker. "I first started playing poker with my grandmother when I was really little," Wise said. "She taught my sisters and me how to play all the classic poker games. When I hit high school, my friends introduced me to Texas hold’em. I've always been fascinated with reading people, so I was hooked right away." While Wise was in high school honing his poker chops, he was also crushing the competition on the mountain. He won his first U.S. National Title at age 15 and turned professional by 18. One reason for his success: being level-headed. Wise brings a professional poker player’s attitude to his work ethic on the half-pipe and understands you’ve got to keep your head while catching air. "It doesn't matter how good you are or how well you read your opponents, there’s still a lot of chance involved," he said. "I think that’s what gets people so hooked. Just because you should win a hand doesn't mean you always do; it's frustrating and intriguing all at the same time." Wise’s tempered enthusiasm and strategic wisdom has paid off away from the slopes at the poker table, and on the slopes. Despite having an illustrious career by age 23, he finds a way to balance time between his family and his career as a rock star half-pipe king. He even manages to sneak a little time in at the casinos to pursue his love of poker. Don’t be surprised if you’re playing a tournament in “The Biggest Little City In the World” and find Wise seated next to you. "I live in Reno, so I've spent some time at the casinos. I like to play the smaller tournaments," he said. Like a poker player who is favored to win a major tournament, Wise has been considered one of the favorites to bring home gold for Team USA. In 2012, he finished first at the Snowbasin Dew Tour stop in Utah and took home gold in both the Euro Winter X Games and the Winter X Games, while finishing second in the Association Of Freeskiing Professionals (AFP) rankings. He continued to improve his name recognition by skyrocketing to the top of the AFP rankings in 2013, earning his sixth national title and taking home a silver medal at the Euro Winter X Games, a gold at the Winter X Games, a third-place finish at the U.S. Gran Prix in Copper Mountain, Colorado, and two first-place finishes at the U.S. Grand Prix in Park City, Utah and at the FIS World Championship. Wise said that being the best at the half-pipe is like becoming a poker player who earns the respect of all players for having mastered all the games. You might expect such wisdom from a guy who plays five- card draw, seven-card stud, and, of course, the world’s most popular poker game of no-limit Texas hold’em. In an interview with Tim Warsinskey of The Plain Dealer, Wise said, "People might focus one aspect — what tricks are going to win. But the reality is that every aspect plays into who wins or loses. You have the technicality of the tricks you do, and the style you do them with and how high you go and now smooth the transitions. The guy who wins isn't necessarily the guy who is doing the hardest tricks. It's going to be the guy who has a little bit of everything. We're constantly debating: Is technicality more important or style?" Wise goes even further by offering an even deeper explanation of the similarity between his take on his time on the slopes and his time on the felt. "Poker is a game of the mind, and mental toughness is a huge part of freeskiing," he said. "It doesn't matter how good you are or what tricks you can do if you can't land them when the pressure is on. Being able to do your best just when you need to is huge; you have to stay cool, calm, and collected no matter how big the competition. Staying calm and collected, no matter the odds or the pot, is equally important in poker." Poised for gold, this 23-year-old master of the half-pipe has his priorities straight. He understands that his hard work is set to pay off in Sochi and that there will be time for WSOP gold later. "I'll work on the gold medal for now. Someday, maybe the bracelet," he said. Katie Uhlaender represents Team USA at Sochi in the skeleton event, which requires this five-foot three-inch speed demon to careen down the ice on a small sled that can reach up to five Gs. 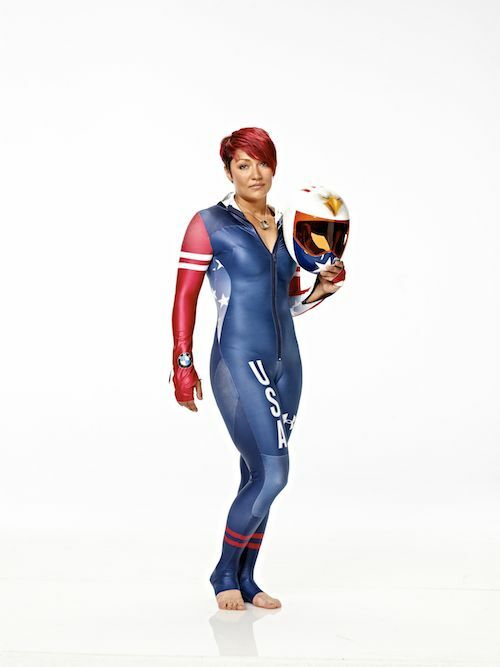 A jack-of-all-trades off the ice, including working on her family’s Kansas ranch and having worked on the production of the hit television show Survivor (Cook Islands edition, 2006), Uhlaender will bring her relentless work ethic to the games in search of gold. To get to Sochi, she even overcame three serious knee surgeries to represent her country. Having taken sixth at the Torino Olympics in 2006, Uhlaender enjoyed two World Cup wins in 2006-2007 and 2007-2008, participated in the 2010 Winter Olympics in Vancouver, and finished third and seventh in the 2012 and 2013 World Cup competitions, respectively. Wearing her late father Ted's Major League Baseball ring for inspiration, Uhlaender is ready to capitalize on her athletic gifts — fearlessness, speed, strength, and smarts — to bring home a medal. Her thrill of flying down the ice on the skeleton transfers to the poker felt, where, she said, her favorite reason for playing is that she likes the suspense of not knowing who is going to win. She said her love of poker came from learning the game with her father, who played for the Minnesota Twins, Cleveland Indians, and Cincinnati Reds. From the beginning, he never took it easy on her. "He never let me win and taught me strategy," she said. "We mostly played Texas hold’em." Like many American poker players, Uhlaender has played online (for free) and has also made the pilgrimage to the brick-and-mortar casinos of Vegas, where she found even more reason to love the game: "It was a huge rush. I loved it, and I won quite a bit of money, actually." This 19-year-old slopestyle skiing daredevil is no stranger to the spotlight. Originally from Lawrenceburg, Indiana, but now a Mt. Hood, Oregon resident, Nick Goepper continues to snowplow the competition and is looking for his first Olympic gold at Sochi. Despite growing up in an area without a lot of well-known slopes to practice his jumps and tricks, he uses terrain-park features such as rails, boxes, jibs, or other obstacles during training runs with the same competitive drive he has while playing poker. According to Goepper, he was first introduced to no-limit Texas hold'em poker during his competition debut while honing his skills on the slopes. "I was 15 at my first Dew Tour with former competitor and roommate, Brent Abrams, and played at night after training," he said. While practicing what he says is his poker philosophy, which requires him to "Find, formulate, and develop a strategy," Goepper had a breakout year in 2011-2012 that saw him finish third at the New Zealand Winter Games; third at Dew Tour Breckenridge in Colorado; second in the Dumont Cup at Bethel, Maine's Sunday River Ski Resort; first at the Dew Tour Snowbasin, a Sun Valley resort in Utah; silver at the Winter X Games; and second overall in the AFP rankings. Goepper made his mark in the AFP world after his monster year in 2013 during which his love for poker grew and his results on the mountains went through the roof. According to Goepper, being mentally competitive both on the mountain and on the poker felt is one of the major reasons for his success. During the year, he took home X Games gold, numerous titles, and finished first overall in the AFP rankings. Goepper's results in 2013 aren’t all that caught people’s attention last year. Having earned the nickname “Heartthrob” while on Dew Tour, the photogenic snow ace received plenty of attention after appearing on the Late Show with David Letterman. Although his newfound fame and potential gold-medal celebrity status might affect some people’s career choices, don’t expect him to trade in his skis anytime soon. Despite hanging with Taylor Swift and Letterman that night and becoming one of the biggest stars of the X Games, his focus is clear — neither his newfound celebrity nor a WSOP bracelet will make him happier than winning gold for Team USA. During his appearance on Letterman, Goepper said of his desire to stay focused: "Don’t get me wrong — I’m flying high right now, but I try to keep [the flying] to when I’m on skis. If I live too much in the moment, what with everything’s that has been happening, that wouldn’t be good." Show your support of Team USA by watching, tweeting, and using Facebook while all of the Winter Olympics (15 different sports) are broadcast via www.NBCOlympics.com. You can also follow Team USA via Twitter by following @USOlympic. *Photos courtesy of NBC Olympics/USOC. The Insiders: C2Rewards CEO Jack Hakim Discusses iGaming Opportunities in the U.S.